Homemade coleslaw with mayo and white vinegar. Similar to KFC's coleslaw recipe and perfect every time! Mama and I are a lot alike in many ways. One thing we have in common is that we always forget the coleslaw (and deviled eggs) in the fridge when it’s time to eat. We usually remember about half way through supper but sometimes we forget altogether and have a laugh at ourselves when we’re putting the leftovers away and find it. Now, I know there are lots of cool coleslaw mixes out there and you can buy the pre-shredded cabbage nowadays but if you want real-deal Southern-style coleslaw, you've got to shred your own cabbage. If you have a food processor, that’s awesome, but you can easily shred a head of cabbage with a hand-held box grater in just a few minutes. If you've never done it before and find the thought a little daunting, just cut the cabbage into eight wedges, cut out the core, and shred it “against the grain” - one wedge at a time. I like my coleslaw with a little horseradish because it has a nice bite but if you want to leave it out, feel free. This recipe makes a moist, slightly sweet coleslaw with just the right amount of twang. 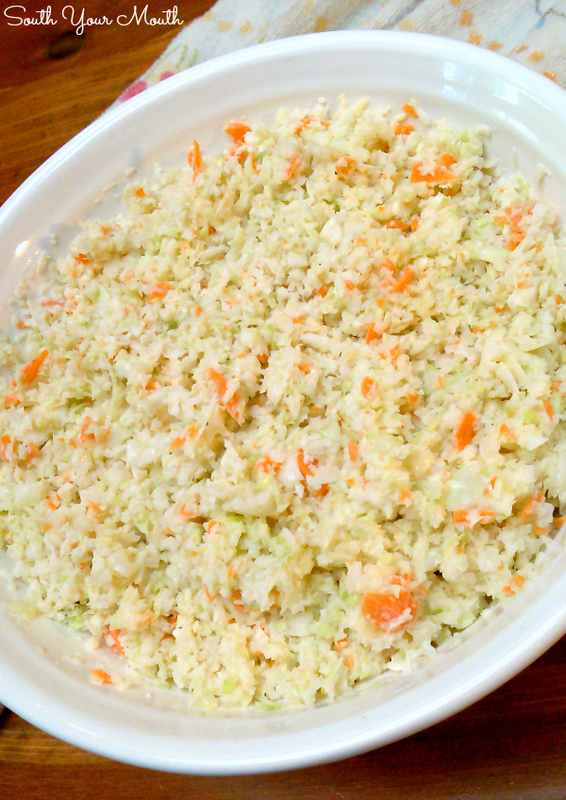 Add shredded cabbage and carrot to a large mixing bowl; set aside. In a smaller bowl, combine remaining ingredients and mix well. Add mayonnaise mixture to cabbage and carrots and mix well. Cover tightly and refrigerate until ready to serve. After you say the blessing, get up and go get the coleslaw out of the refrigerator and put it on the table too. I wish I had this recipe last night! My stud of a husband made a small portion of slaw and it just tasted like mayo and it was too late to call my Gramma and ask for the recipe. Tonight there will be redemption! I cant wait to try this. Hubby loves KFC coleslaw, so usually add tarragon & sugar. A little too sweet for me, but he lovesssssssssss horseradish. Would be a welcome change! forgetting the coleslaw and deviled eggs must be a Southern thing cause they always got forgotten at our house too lol. Actually we live in IN but Dad was from KY and Mom from TN so we still claimed to be from the South lol. Thank you thank you thank you! This is how my Gramma Ginny used to make it and I never could get the receipe right. Now....got anything for potato salad that has eggs and finely cut up potatoes???? My hubbys stepmom made the best potato salad and sadly she has passed.....I so miss summer without it. Thanks again! I made this tonight and it was DELICIOUS! Actually, I didn't have the horseradish on hand, so I just went without it. I can't wait to try it with, though. Thanks so much for sharing. 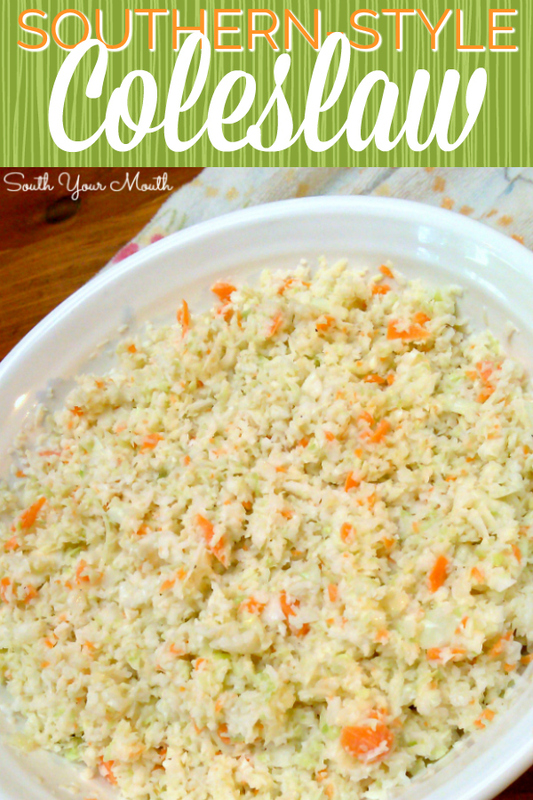 I'm so happy to have a "go to" recipe for coleslaw now! YAY!!! Thank you so much for taking the time to let me know you liked it! I make a coleslaw everyone loves... everyone except me, that is! THIS is the recipe I've been looking for.... THANKS!! I make mine the same way except I use Miracle Whip. Instead of white vinegar I used apple cider vinegar. Also left out the horseradish and use a few drops of Texas Pete. Also used a tablespoon of lemon juice. Better the next day flavors had time to marry. Beautiful, and tasty! Never thought to add horse radish, but now I gots to try that! I bet it makes the coleslaw sing. Love your blog. You do so many things that I like and my family likes. Happy Holidays. Sounds good to me! Similar to mine, I add a bit of red cabbage for color, only use the mayo that begins with H or D, I don't add milk, and I use red wine vinegar (and sometimes a splash of pickled jalapeno pepper juice). I love it to cut through the fat in mashed potatoes and stuffing/dressing. I have to have it at Thanksgiving, Christmas and anytime there is bar-b-que! Sounds good (minus the horseradish, my husband won't eat it) to me. Pinning to try! I doubled the recipe but only used half the horseradish because I was afraid it might be too strong. It was really, really delicious. It may be even better with all the horseradish, but it was for a family reunion and I was afraid it might be too strong for some people. I might try it next time full horseradish. It's a keeper.